Although the title is somewhat rare therefore if there is forms to control our PC through Twitter with some simple commands. With TweetMyPC we can control our PC remotely and although there is much variety of applications that allow it there is no used under Twitter so it becomes something very new. Create a Twitter account for your PC, and be sure to put it as private so that nobody can see the command you send. Download and install the application TweetMyPC. 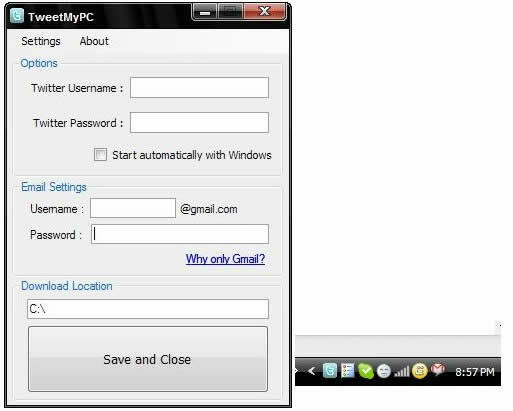 Open TweetMyPC and writes the data access the Twitter account for your PC and put an email address, this address should be Gmail. Usually leaves the application running on your PC and send Tweets from elsewhere with the commands using the Twitter account from your PC. Download = You can send an order to download any file you want.